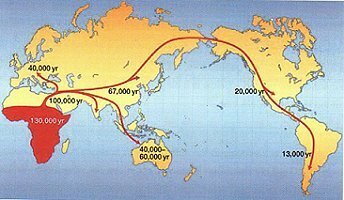 Tests identifying percentages of biogeographical ancestry are based on the complete revelation of the human genome in 2002 (Human Genome Project). The human genome is at least 99.5% identical in all humans. A person's genome is a random recombination of DNA over thousands of years. Biogeographical ancestry tests, which only look at a very tiny percentage of the human genome, show a person's ancestral percentages from the world's major population groups. Test results may be accumulated from many, many generations. Fifteen generations account for over thirty-two thousand ancestors in five hundred years or so and twenty generations account for over a million ancestors. Thanks to DNAPrint Genomics Inc. in Sarasota, Florida, USA for providing the DNA test results. Visit www.ancestrybydna.com for more information.